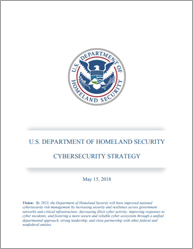 This week the US Department of Homeland Security unveiled a new national strategy for addressing the growing threat of cyber security risks. According to the report, by 2020 more than 20 billion devices are expected to be connected to the internet, and a result of this growth and the increasing variety of these devices, a new approach to cyber security is required. The new strategy was released in compliance with the fiscal 2017 National Defence Authorisation Act, the DHS noted, and has been designed to prioritise and harmonise the department’s programming, planning, operational and budgeting efforts. The DHS, which is responsible for securing federal networks and critical infrastructure from cyber sabotage, has identified five key areas of risk, or ‘pillars’, that it hopes to manage though the strategy, including risk identification, vulnerability reduction, consequence mitigation, enablement of cyber outcomes and threat reduction. These risk areas are particularly noteworthy given the evolution of cyber criminality in recent years. In particular, the strategy refers to the breadth of attempted cyber attacks on US government networks, which increased more than tenfold between 2006 and 2015. The announcement of the new strategy came on the same day that the White House removed the cybersecurity coordinator position from the National Security Council (NSC), as it felt that the role was no longer necessary.